Our flights are already booked. Confession: Hotels dictate my travel plans more often than I care to admit. It’s not that the beaches of Tulum aren’t enticing on their own or that I have no interest in roaming the streets of Lisbon unless I come home to a dimly lit lobby buzzing with attractive strangers at the end of a long day of sightseeing, but it’s certainly a plus. Ordinarily, my friends would have to drag me kicking and screaming to spend a weekend with them in Las Vegas—the city of sin’s famed pool parties aren’t exactly my idea of a good time—but if you tell me that The NoMad just opened a property there, my flights will be booked stat. As an editor of all things design, travel, and food, I would be doing myself a disservice if I didn’t stay abreast of hotel openings near and far. In fact, I follow them like others follow football player trades or variations in the stock market—a habit that often causes more FOMO than wanderlust (and isn’t exactly cash-flow positive). And while newly opened, far-flung African safari lodges and over-water French Polynesia resorts are most often out of reach, other, more approachable local hotels aren’t. Flying to Detroit for the weekend is, in fact, much easier than escaping to the Patagonian tundra or experiencing the wonders of Marrakesh—so is driving up to the Hudson Valley for a few days. If you’re in search of achievable short-haul travel plans for 2019, here are a few new design hotels around the U.S. that might tickle your fancy. Better yet, they’re in fantastic North American cities that are worth a gander—if you haven’t visited them already. Just when we thought that upstate New York couldn’t house yet another design hotel comes Troutbeck—Amenia’s answer to the flocks of Manhattanites escaping to the north on weekends. The hotel joins an already saturated string of cool inns and lodges, each promising world-class cuisine, fresh air, peace, and quiet—so what makes this one different? For starters, the 250-year-old inn once played host to the likes of Mark Twain, Ernest Hemmingway, and Teddy Roosevelt. The restaurant is run by the former chef at Fish & Game, Hudson’s only Michelin-starred restaurant. Why we love it: The property of Troutbeck itself is a sight to behold: a glorious lawn leading to a massive slate-covered Manor House set on a 45-acre property. The interiors, created by design firm Champalimaud who outfitted famous spaces from the Raffles in Singapore to The Carlyle in Manhattan, is reminiscent of a North American Soho Farmhouse. With 37 guests rooms, neatly manicured garden paths, two U.S. Open–surface tennis courts, and a Slim Aaron–esque midcentury pool, this property is bound to become the next It location for weekending New Yorkers. At first glance, you wouldn’t notice that Savannah’s newest hotel, Perry Lane, is part of the Marriott brand’s Luxury Collection. Intimate interiors and historic features are reminiscent of the city’s quaint B&Bs and guest houses more than they are of an international hotel chain. This is precisely what makes this hotel blend in while standing out in Savannah’s Historic District. Libraries, lounges, restaurants, cocktail bars, and replenished cookie jars all make up the charm of this carefully curated hotel. Why we love it: Following a careful study of the local culture and ethos, Perry Lane offers an authentic local experience: cozy libraries and lounges, vintage accents, live music, and even a daily afternoon bar cart serving the complimentary cocktail of the day. The guest rooms are outfitted for ultimate classic style and comfort—offering everything from Frette linens to Netflix. In the summer, a guest-only rooftop pool provides a respite from the area’s hustle and bustle. Perhaps 2018’s most anticipated hotel opening in the U.S. is Detroit’s Siren Hotel, designed by ASH NYC. After sitting abandoned for three decades, the 1920s Wurlitzer building is reinvigorated—a wistful metaphor for the city’s recent ups and downs. Squeezing every inch of real estate to its full potential, the 106-room hotel boasts 10 retail, food, and beverage outlets, including a blush pink cocktail bar, an eight-seater tasting counter, a barbershop, florist, and a rooftop bar. Why we love it: In true ASH NYC fashion, the hotel is at the fulcrum of cool. The Art Deco influences speak to the building’s opulent yet essentialist history. In the common areas, the mood is plush: a verdant green lobby with veined marble counters, a bar that feels like the inside of a pink jewelry box, all boasting original plaster detailing, terra-cotta signs, and travertine floors. The rooms are a little simpler—becalmed in pink-hued walls and boasting minimalist terrazzo bathroom vanities. All in all, every corner of this hotel is a sight to behold. In 2018, a hyped European boutique hotel chain made its first foray into the North American market. Earlier this year, The Hoxton hotel opened in Williamsburg, Brooklyn—along the evergrowing stretch of hip design hotels that’s become Wythe Avenue. Ever since, The Hoxton has been attracting in-the-know travelers and Manhattanites in search of a type of Soho House sans membership. Food-wise, an outdoor mezzanine and rooftop are bound to become next summer’s hot spots, while the restaurant, Klein’s, is already attracting crowds with its brasserie-style, classic American offerings. Why we love it: Plush pink velvet seating in the lounge area sets the scene for mingling, working, or grabbing a drink. The public spaces—designed by Ennismore Design Studio in collaboration with Soho House, the hotel’s longtime partner—have a similar vibe to that of the private club chain. Cozy velvet seating, vintage furniture, and two roaring fireplaces create a familiar and intimate atmosphere that lend themselves just as well to a quiet co-working space in the daytime as it does to a lively social scene at night. Amidst a sea of cheap casinos and slot machines, the newly opened NoMad Hotel in Las Vegas is a sophisticate’s respite. Eons away from sin city stereotypes, this new hotel, located on the top four floors of the Park MGM Resort, has its own private entrance, 293 guest rooms, a NoMad Bar, and a dining room overseen by chef Daniel Humm and restaurateur Will Guidara of Eleven Madison Park. In true Vegas fashion, there is also the NoMad Casino—though it’s inspired by classic European gaming parlors, featuring high-limit baccarat, blackjack, and roulette underneath a Tiffany glass ceiling. Why we love it: The Jacques Garcia–designed hotel is familiar to those who know and love the NoMad locations in New York City and Los Angeles, but it feels different—lighter, more opulent, and frivolous. Desert tones give the European interiors a sense of belonging in the barren lands of Nevada. A pool, inspired by Marrakesh’s infamous Jardins Majorelle—is poised to bring a sophisticated air to Vegas’s pool season. Those wanting to visit New Orleans’s Maison de la Luz will have to hold off a little longer, but the wait will be worth it. Atelier Ace announced, last summer, a luxury spin-off from the brand’s popular North American hotels. The new 67-room property will open across the street from the Ace Hotel New Orleans in the Central Business District—forming a traveler’s hub in the quaint French-influenced Southern metropolis. Why we love it: Atelier Ace partnered with L.A.-based Studio Shamshiri to design Maison de la Luz, described as a new type of guest house for discerning travelers seeking a quiet refuge. Colorful marble floors, plush seating, and French wallpaper set the scene for an intimate experience. A curated concierge service, private breakfast room, and library bar will replace the hotel brand’s often packed public spaces, creating a more private and elevated setting. Angelenos will probably already be familiar with Palihotel, a small boutique hotel chain spanning from Santa Monica to West Hollywood. This year, Palihotel expands outside of its native city to Seattle—the fourth location for this rapidly growing brand, also set to open in Miami, San Francisco, and Portland. Located in the former Colonnade Hotel across from the iconic Pike Place, the 96-room hotel boasts an award-winning restaurant, bar, and coffee shop. Why we love it: Palihotel is known for its intimate, neighborhood-oriented, and highly curated atmosphere, bringing a sense of place and belonging to locals and travelers alike. Taking this philosophy to Seattle, Palihotel boasts a moss-green lobby filled with books, cozy leather sofas, vintage suitcases, potted plants, and local artwork. The color palette is carried throughout each of the guestrooms, which also feature pink floral headboards, white dome lamps, and Smeg mini fridges. Located in a dramatic Neoclassical Revival building that once housed the First Church of Christ, Scientist in Washington, D.C.’s Adams Morgan neighborhood is The Line—a new hotel by Sydell Group (also owners of the NoMad, Saguaro, and The Ned). Opened over the holidays last year, this 220-room hotel overlooking the Washington Monument and the Washington National Cathedral is the brand’s second location and it boasts three restaurants, two bars, a coffee shop, and a podcast-recording studio. Why we love it: You’ll find many nods to the building’s past in The Line hotel: a chandelier made of organ pipes dangling from the 60-foot vaulted lobby, pews in lieu of public seating, and hymnal boards serving as guest room numbers. 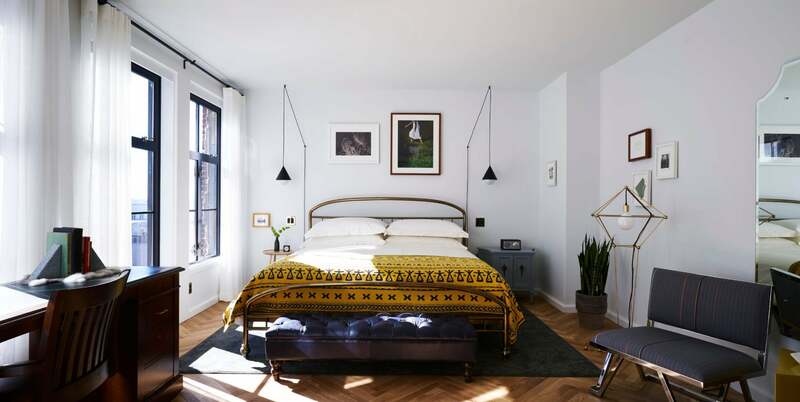 The light-filled guest rooms are no less impressive with their herringbone hardwood floors sculptural bedside lamps by Flos, and bright yellow blankets—all inspired by D.C. townhouse apartments.